kartik kannan's space on the web: SCMHRD- Insecurity? I happened to see this advertisement in Outlook, when they carried a story on B schools and their unexplainable rankings. 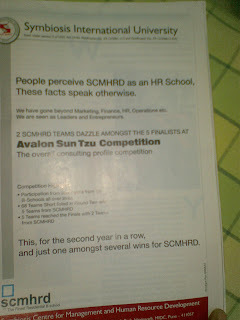 I always thought SCMHRD was a decent B school, but it looks like they seem to have dug themselves in a hole with their name, which has positioned them as a HR B-school. They are trying to reverse that by spending a few lakhs on re-branding themselves, but what is tough to swallow is the way they are doing it. Showcasing that their students won some random case study contest, and thus saying that their B school is intelligent in other aspects also, is a bad case of I-want-attention- syndrome that lower rung B schools like IIPM resort to. I once saw a B school advertise that their school won 3rd prize in debate and 2nd prize in Rangoli at some local college and that was advertised as one of the USP's. Schools like XLRI are also largely percieved as HR B schools but the brand is so strong tha despite that, their grads get placed in other functions to(especially people who've taken the BM discipline instead of PM&IR). Private B school positioning is an interesting aspect in a largely cluttered market. How do u decide which B school is right for you. IIPM and its likes tries to show boys and girls in a self important pose and usually plug a long message from its dean, and puts some attention grabbing techniques like "IIPM-dares to challenge IIMs". Now that SCMHRD has done such an advert, I hope these guys get serious about their Brand equity and get an ad/branding/PR agency to manage their brand, else the serious Snap aspirants may give it a miss, as the ad sounds pretty IIPM like. ( Nothing against IIPM, just that their advertising makes me fall from my seat every time). I am sure SCMHRD is a decent B school, and they just dont need this insecurity feeling, to go splurge on print media advertising in such a manner. Dude...whoever u are....i think great lakes has blocked ur mind to see the true picture....please try doing another MBA...maybe that will teach u how to brand things.